It’s not unusual for busy actors to have more than one film in cinemas at the same time. Sienna Miller can be seen at the moment doing excellent work in Foxcatcher and American Sniper. Alicia Vikander just had three films released in three consecutive weeks with Testament of Youth, Son of a Gun and Ex Machina. Her co-star in that last movie, Oscar Isaac, also has A Most Violent Year out at the moment and appearing in that film, as well as the Martin Luther King movie Selma, is David Oyelowo. In the last few years British actor Oyelowo has established himself as a strong supporting player in films such as Rise of the Planet of the Apes, The Help, Jack Reacher, The Butler and Interstellar. He was only in one scene in Lincoln but still stuck out in a cast that included Sally Field, Tommy Lee Jones and, of course, Daniel Day Lewis. As with most of these other movies his role in A Most Violent Year is a supporting one but he gives another very memorable performance. Taking lead duties alongside Isaacs is Jessica Chastain, the two of them playing a married couple trying to run a New York business in 1981, one of the worst years for violent crime the city ever saw. The marketing for the film makes it look like a gangster picture (possibly on purpose) but that is distinctly not what it is. Isaac’s immigrant Abel Morales is desperately trying to be successful without using his wife’s mob connections even though his oil company is repeatedly ripped off by armed hoods and most of his competitors are backed by the mafia. This is the story of a man determined not to be a Goodfella though. For as long as he can remember he never wanted to be a gangster. A Most Violent Year’s strength is in how it plays with these expectations. The gun his kid finds in the trailer is not his and the crimes he is accused of are not ones he has committed. Also, despite that title, none of it is overly violent. Oyelowo plays the District Attorney doggedly following the central couple and in the end he isn’t quite what you expect either. The actor makes this an intriguing character even if it is only a bit part. 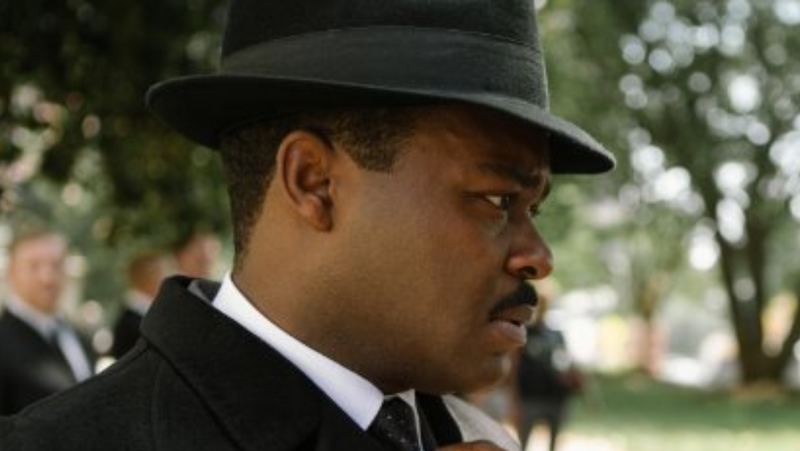 Selma, by contrast, gives Oyelowo the lead role and he rises to the challenge brilliantly. This isn’t just any part either, this is Martin Luther King Jr. It seems incredible that any element of this man’s tale and that of his equal rights movement has not made it to the big screen before. As with Spielberg’s Lincoln, there is no attempt to squeeze a full biopic into two or three hours and the film just concentrates on one episode in the great man’s life. In this instant it is the organisation of the epic fifty four mile demonstration march from Selma to Montgomery in Alabama in March 1965. Other campaigns in his human rights struggle have been dramatised for TV, most notably in Boycott, with English actor Carmen Ejogo playing Coretta Scott King just as she does here, but is the first Luther King film to play in cinemas. Frankly it is about time these events were shared with the widest possible audience. This is a powerful and inspiring story and it is well told without too much sentiment. Other film makers may have had less restraint but director Ava DuVernay gets the balance right. We concentrate on the people and their relationships enough to make them human and appreciate what they are risking. There have been some films recently where the strength and importance of the true narrative have carried things forward. The Imitation Game was in truth a little clichéd and The Long Walk to Freedom was poorly paced but they deserved to be seen for stories they told. That isn’t what is going on here though. The dramatisation is carried by what happened in history but it doesn’t struggle under the weight of it or loss faith that it has the strength to do the job. Neither are the audience being pulled through to the end by their heartstrings. That isn’t to say that watching Selma is not a highly emotional experience. You really get a sense of how brave those involved in the non-violent marches were and the courage it took not to hit back in the face of unimaginable and cruelly barbaric opposition. Interestingly the film also looks at King’s tactics and how he wasn’t afraid to manipulate the situation people were in. The man as presented here doesn’t deliberately court violence but he knows that news and images of white law enforcers beating up demonstrators bring support for the cause. There is a good examination of how far he is prepared to go with this when in many cases involvement in the march means people are walking off to their slaughter. Selma is an excellent film that avoids cliche at every turn. For example there is a scene at the beginning where Oprah Winfrey’s character has her application to vote turned down and I was nervous we’d have to watch her return to the registration office once the Voting Rights Act had been passed. Thankfully this does not happen. You know that at some point in the story process they’d have though about it but they knew such a moment would be laboured and completely unnecessary. Similarly there is a moment when the put upon activists start bonding through song and my heart began to sink but the action smartly cuts away one line into the song once the point is made. They also handle the insertion of real footage particularly well. Oyelowo is absolutely superb in the film and while this really ought to guarantee him a string of weighty starring roles that fact is that the opportunities are still not there for black actors. This is something Oyelowo himself has discussed in interviews and he has a good point. Just look at Denzel Washington who once appeared in movies like Cry Freedom, Glory and Malcolm X but has now gone the way of Liam Neeson, keeping his career going as a middle aged hard man. Here’s hoping that the work of this brilliant actor marks a bit of a sea change.